Last Updated: November 24, 2015 | Subscribe to our weekly newsletter! Got frogs in your pool? One of the most common pests you will find hanging in and around your pool are frogs. There is just something about a nice, large, refreshing pool that attracts frogs from all over. Of course, what ends up happening is you must continually remove dead frogs from your pool, which isn’t the most thrilling of tasks to say the least. While frogs are a relatively benign threat to pools, they can be a nuisance. Let’s explore why frogs love your pool so much and look at a few steps you can take to get rid of them once and for all. Why Do Frogs Love Swimming Pools? Have you ever wondered why frogs always seem to end up in your pool? The reasons are quite simple – food and water. At night, the water in your pool acts like a giant reflector to any light source that is close by. This attracts bugs who discover a gigantic watering hole where they can steal a drink or two. This influx of bugs at night then attracts the frogs who eat the bugs as their main food source. The bugs get them there, but then they also discover a giant watering hole where they can even take a swim. What they don’t realize is they can’t get out once they dive in. In the end, most will simply drown in the pool leaving it up to you to remove them from your pool, and that’s definitely not the most fun task you will do on even your worst of days. Are Frogs Bad for Your Pool? The good news is the frogs aren’t actually bad for your pool. In fact, they actually eat a lot of bugs that you would normally have to clean from your pool making your job a little easier. When they do drown, the water circulation will often bring their bodies into the skimmer making it relatively easy to clean, even if it is a little gross. If you are concerned about disease because of the frogs, don’t be. The chemicals in your pool will take care of any pesky bacteria that may be hiding out on the frog and most don’t carry anything harmful to humans anyway. Just because they aren’t bad for the pool, that doesn’t mean you are automatically alright with becoming the frog mortician for your home, cleaning up body after body after body. There are ways you can reduce the number of frogs around your pool, however. Let’s take a look at some of the best methods you can employ to reduce the frog population around your swimming hole. Installing a fence around the perimeter of your pool area is a great first step in frog defense and it also makes your pool much safer and more secure in the process. Solid wood fences are your best option to keep frogs away as small frogs could still slip through the holes in chain link fencing. At night or whenever you are not using your swimming pool, consider pulling a cover over it to prevent bugs and frogs from entering your pool. These covers should be easy to install and remove but still fastened securely to children and animals can’t accidentally slip under them and get trapped in the pool. Frogs love to hide in weeds and brush piles. If you want to reduce your frog population, remove any weeds and carefully landscape your garden areas using ammonia-based fertilizer to discourage the frogs from hiding their as well. 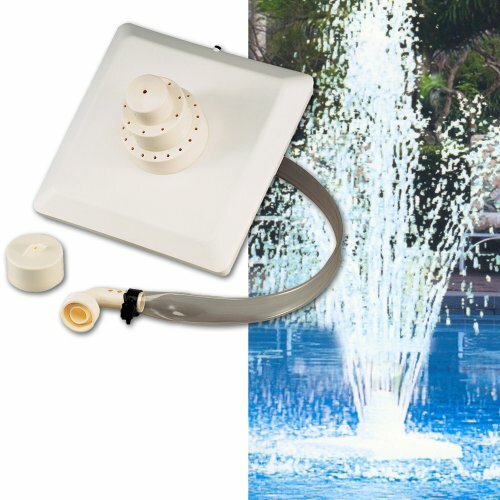 The lights in and around your pool attract bugs who then begin using your pool as a drinking fountain. This attracts the frogs to your pool as they look to feast on the bugs and take a drink and a swim while they are there. When you aren’t using your pool, make sure all lights around the pool and even in the pool are turned off so fewer bugs are attracted to your pool. Frogs are attracted to insects. And insects are attracted to stagnant water. So if you keep the water in your pool moving, it will be hard for insects to lay eggs and create more bugs to attract more frogs. The circle of life (holding up a young Simba)! Believe it or not, frogs hate hot water. I guess because they’re cold blooded. Either way, keeping your pool warm will help keep frogs away. Which I’m sure is great for you because who doesn’t like a nice warm pool? I recommend using a solar cover. 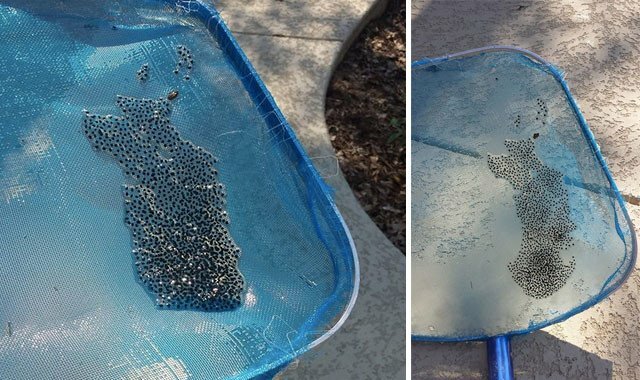 It will heat your pool and act as a cover to keep the frogs away. You can also use solar rings, which acts like a solar cover but is easier to take on and off the pool. If you want to make the investment, go for a real pool heater. I wrote a massive guide on how to buy the best pool heater here and linked below. 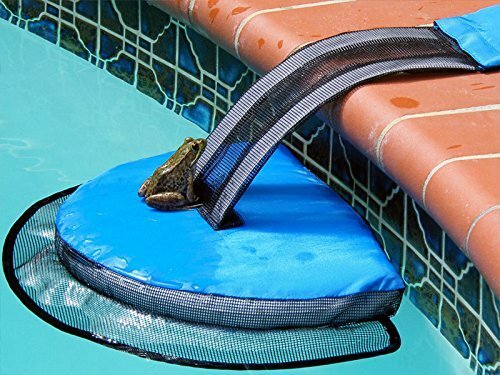 If you have a problem with a lot of dead frogs in your pool, you can install a simple little device to allow them to climb out of your pool so they don’t drown. Of course, this only works if there are frogs in your pool. If you follow the steps above, hopefully they’ll never enter your pool in the first place. 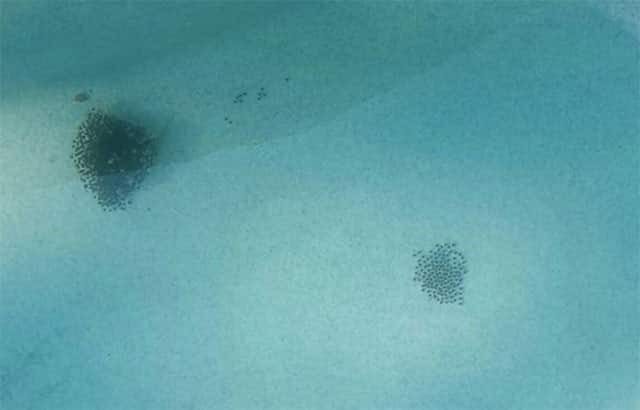 What About Finding Frog Eggs In Your Pool? A pool owner reached out to me on Facebook and sent me these photos. She had no idea what she was skimming out of her pool. She was skimming out frog eggs. Lots of them! If you follow all the steps above for keeping frogs out of your pool, you won’t deal with frog eggs. Frogs create frog eggs — who knew? However, if you end up with frog eggs in your pool, skim them out like the photo above and place them far away from you pool in a more suitable habitat for the frog babies. While it may be impossible to completely rid your pool of frogs, taking the steps above can definitely help you reduce your frog population so your pool doesn’t become known as the grim reaper of frogs. Remember, the frogs won’t hurt you so if you do see one swimming in your pool, try to remove it before it drowns. Just take it somewhere away from your pool area before you release it. What are water bugs and why are they in my pool? And even better question is, how do I get rid of water bugs? Learn everything you need to know here. Learn how to keep worms out of the pool so you don't have to worry about those creepy crawlies dirtying up your pool or running down your back. Wondering, "how to keep ducks out of my pool?" We've got 5 tricks to keep those pesky, pooping birds out of your swimming pool water. West Nile Virus. Zika Virus. Both transmitted by mosquitoes. 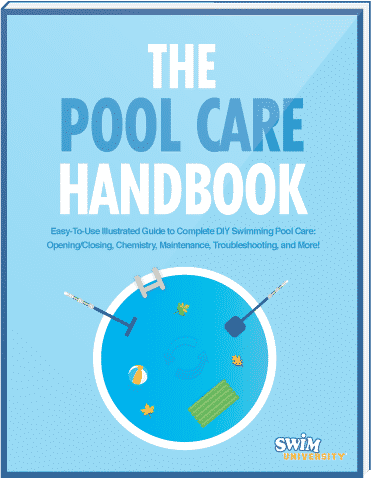 Learn how to keep mosquitoes away from your pool, and protect your family from these diseases. Bees and wasps a problem at your pool? Find out what you can do to keep wasps and bees away from a swimming pool once and for all.